Prague, Czech Republic, 2018-May-09 — /Travel PR News/ — Four Seasons Hotel Prague has announced the appointment of Arpád Szucs as the new Pastry Chef. Arpád comes to Four Seasons in Prague from Four Seasons Hotel Gresham Palace Budapest. Arpád Szucs is creating a new selection of high quality European style breakfast pastries and desserts for CottoCrudo and The Gallery. He started working as a Pastry Chef at Four Seasons 12 years ago in 2006, first in Budapest, then Milan, London and Budapest again. Arpád was born in Budapest. He fondly remembers his grandmother making strudel every weekend – usually two or three kinds – with apples, quark and poppy seeds or dumplings with homemade apricot jam. This inspired him to make his first dessert aged sixteen, a punch cake for his father. Arpád’s father was a great supporter of his passion for cooking. After telling him he wanted to become a chef, they went looking for a school and found the Taverna Gastronomy School in Budapest. Here he was exposed to all areas of cooking and discovered his love for pastry. He received two diplomas there. 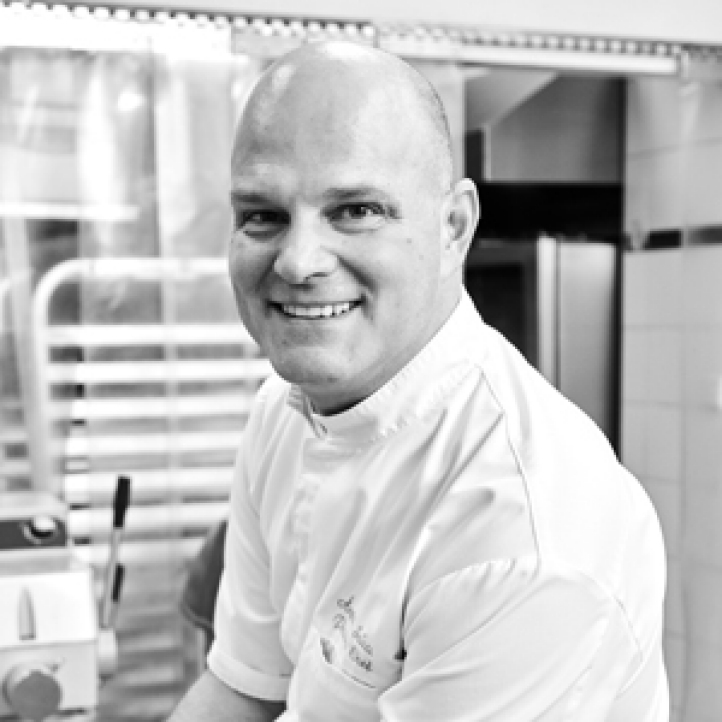 After specialising in gastronomy in high school and university he went on to L’École Valrhona de Tain L’Hermitage – a famous chocolatier school in France close to Lyon. It is the most prestigious pastry school in the world, not just any pastry chef can attend. After a week long course, the chefs feeling for pastry and chocolate is completely different and they receive a certificate to prove it. Valrhona chocolate has been described as the Rolls Royce of chocolate and it is one of Arpád’s favourite ingredients to use. Mix all ingredients for 8 minutes, then let rest one day in the fridge. On a tray with baking paper, let it rise for 30 minuties at 40 degrees C. Add tomatoes, herbs and any other desired flavours, and bake 15 minutes at 210 degrees C.
His confectionary is based on French high standards, putting local ingredients forward, inspired from the old middle class ways and creating top quality pastries and dessert variations. Maintaining this high French standard Arpád also likes to mix in different traditions. Hungarian, Czech and Italian recipes are all brought together making him a truly Central European pastry chef. When he is not whipping up delicious pastries at Four Seasons, his favourite dessert to make at home for his wife and kids is a special Hungarian cake called gerbeaud. Cooking must run in the family as his son is also following in his father’s footsteps. He is currently cooking in the Intercontinental Hotel, Budapest. This entry was posted in Food & Drinks, Hospitality, Hotels, Luxury, Travel, Travel Services, Travelers and tagged Arpád Szucs, Four Seasons Hotel Prague, Pastry Chef. Bookmark the permalink.